Many insects and crustaceans possess hard, armor-like exoskeletons that, in theory, should weigh the creatures down. But, instead, the exoskeletons are surprisingly light -- even allowing the armor-wearing insects, like the beetle, to fly. Northwestern Engineering's Horacio D. Espinosa and his group are working to understand the underlying design principles and mechanical properties that result in structures with these unique, ideal properties. This work could ultimately uncover information that could guide the design and manufacturing of new and improved artificial materials by emulating these time-tested natural patterns, a process known as bio-mimicry. Supported by the Air Force Office of Scientific Research's Multidisciplinary University Research Initiative (MURI), the research was featured on the cover of Advanced Functional Materials. Postdoctoral fellows Ruiguo Yang and Wei Gao and graduate student Alireza Zaheri, all members of Espinosa's laboratory, were co-first authors of the paper. Cheryl Hayashi, professor of biology at the University of California, Riverside, was also a co-author. 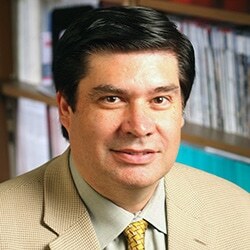 "It is very challenging to characterize the properties of such fibers given that they are directionally dependent and have a small diameter of just 20 nanometers," said Espinosa, the James N. and Nancy J. Farley Professor in Manufacturing and Entrepreneurship at Northwestern's McCormick School of Engineering. "We had to develop a novel characterization method by taking advantage of the spatial distribution of fibers in the Bouligand structure." "With more than a million species, which greatly vary from each other in taxomic relatedness, size, and ecology, the beetle is the largest group of insects," Hayashi said. "What makes this research exciting is that the methods applied to the Cotinis mutabilis beetle exoskeleton can be extended to other beetle species."